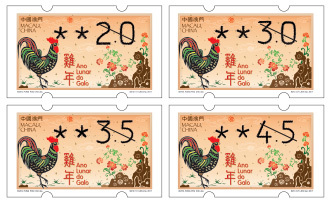 Stamp Issue "Lunar Year of the Rooster (Label Stamp)"
STAMP ISSUE OF LABEL STAMP "LUNAR YEAR OF THE ROOSTER"
Macao Post and Telecommunications Bureau issued the label stamps “Lunar Year of the Snake”, “Lunar Year of the Horse”, “Lunar Year of the Goat” and “Lunar Year of the Monkey” under the stamp series of Chinese Zodiac between 2013 and 2016. 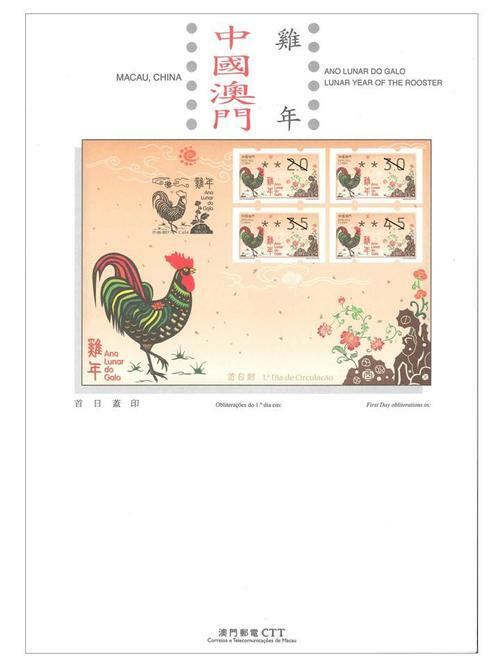 The fifth issue with the stamp theme “Lunar Year of the Rooster” will be issued on 17th May, 2017, the printing quantity is 1,000,000 label stamps. 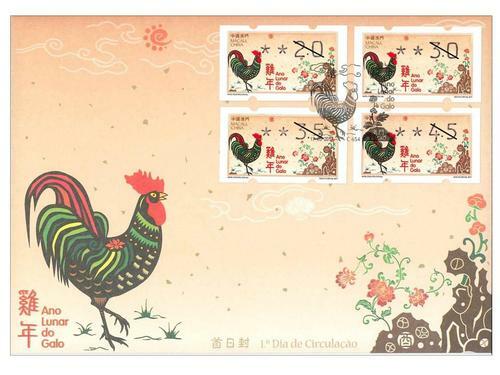 Since the pronunciation of “Rooster” and “Lucky” in Chinese are homophonic, rooster has become the symbol of lucky. Therefore, people apply it in various folk arts, such as rooster head shoe, rooster paper cutting, rooster satchel, rooster bellyband, rooster pillow, rooster pillow support, rooster apron and rooster waistcoat, they all serve as an unique scenery among the people. 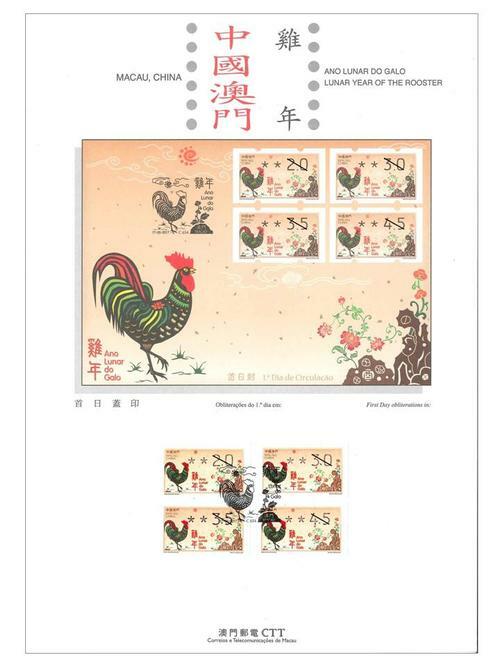 In addition, the stamps of Lunar Year of the Rooster over the years had also reflected the images of rooster, which are lucky, brilliant, mighty and strong. On the issue date, the maximum sales quota per queuing customer is 20 sets of label stamps, 3 first day covers with label stamps and 3 information brochures with label stamps. Besides, the following designated automatic stamp vending machines will have a temporary arrangement; the maximum time limit for using the vending machine is 10 minutes for each queuing customer. This is the third theme in 2017. 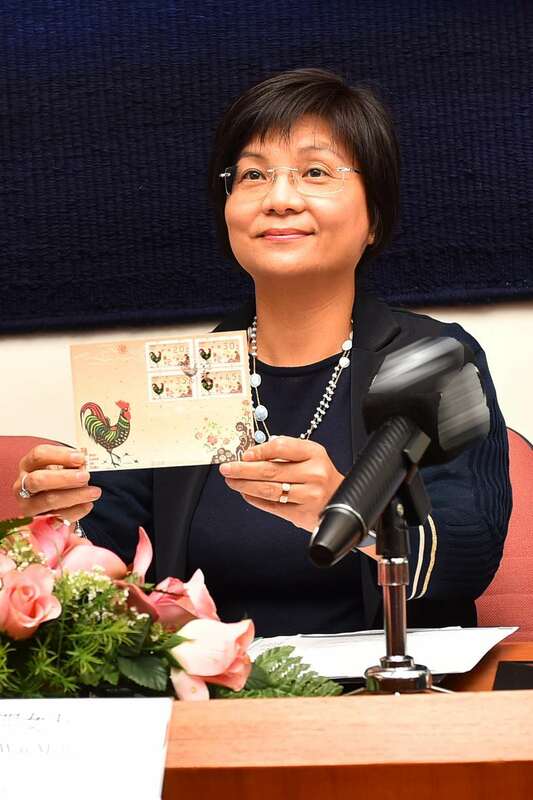 The previous issued stamps are “Lunar Year of the Rooster” (commemorative stamp) issued on 05/01/2017, “Macao: Back to Common Roots” on 10/02/2017, and “Traditional Chinese Culture” on 01/03/2017.